Transform Christmas leftovers into this golden-baked asparagus, ham and cheese tart. Preheat oven to 230oC. In a frying pan, sauté butter with finely chopped shallots for 1 minute. Add asparagus and cook until tender (about 5 minutes). Set the mixture aside while preparing the pastry. Open crust pastry and roll out on a lightly floured piece of grease proof paper. Transfer pastry to a 9 inch round springform or loose bottomed tin ensuring the pastry lines the edge of the tin. Whisk 6 whole eggs and 2 egg yolks together until thick and add the grated cheese to form a creamy mixture. Pour the mixture into the pastry lined tin, leaving 1 inch border crust. 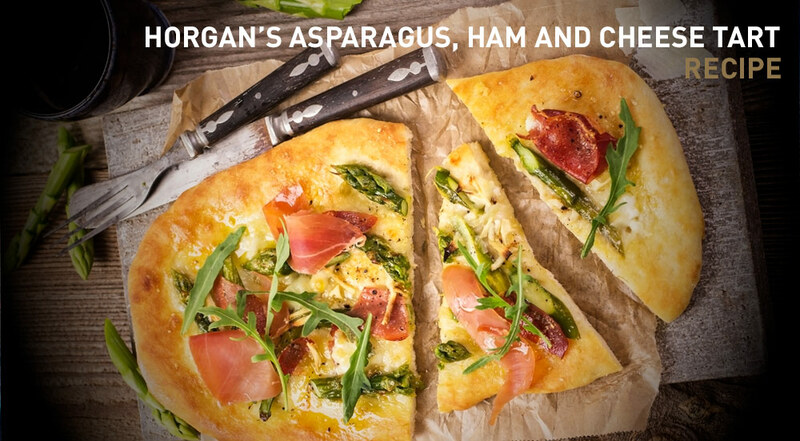 Sprinkle the prepared shallots and asparagus, sliced sundried tomatoes, Horgan’s Lightly Smoked Ham, salt and pepper on top of the egg & cheese mix. Brush the edge of the tart with the egg yolk/water mixture. Bake until golden brown and the pastry is cooked, approx. 20 – 25 mins.